Japan-based Logitec has now announced two LDR-PMD8U2L series external DVD burners, the black LDR-PMD8U2LBK and reddish LDR-PMD8U2LRD. 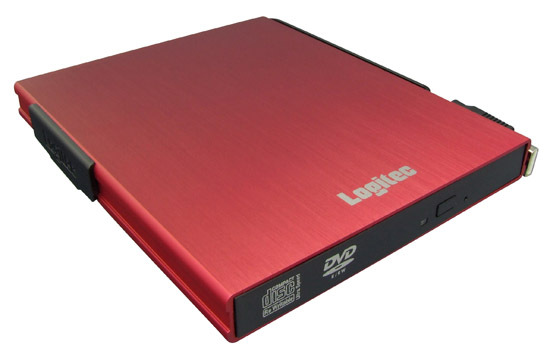 Pictured below, the drives measure 133.6 (W) x 160 (D) x 17.7 (H) mm, weight 415 grams, have USB 2.0/1.1 connectivity, and have maximum writings speeds of 8x for DVD+R/-R/-RW, 6x for DVD+R/-R DL, DVD-RW, 5x for DVD-RAM and 24x for CD-R/-RW. While both drives are set to cost about $92 (without taxes), the all-back model will arrive by the end of the month with the red one being expected to hit stores in early January.